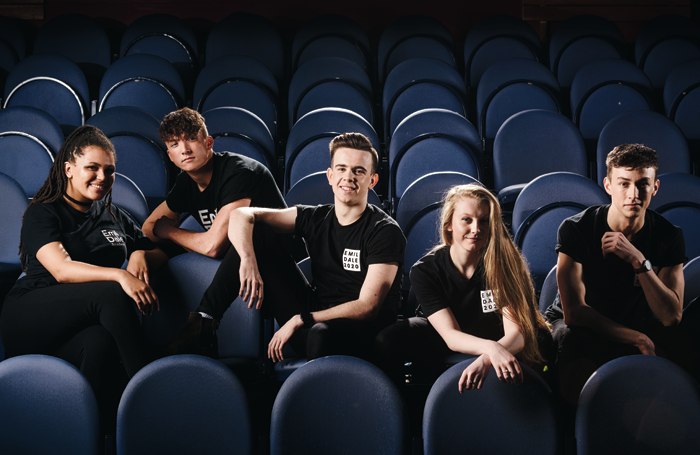 The Stage Scholarships has been running for more than 20 years, helping many hundreds of youngsters follow their dreams, with former winners going on to work in shows ranging from Wicked in the West End to Robert Icke’s production of Oresteia. Here, we introduce the winners for 2017, aged between six and 24 years old, including a few who have already made their West End debuts. They represent a selection of the 168 young people who won scholarships in 2017 worth a total of more than £650,000, sponsored by our 10 partner schools. 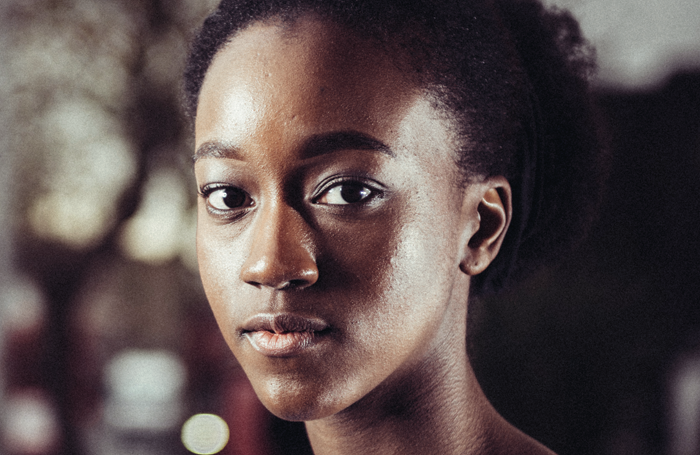 Masego Makgobe, 18, from Redbridge, London won The Stage Scholarship to attend the musical theatre one-year foundation course at Read College. She said: “When I got the call about the scholarship I didn’t believe it at first, it took a while for it to hit me. I saw the talent that was there on the audition day, I felt so grateful to be picked, that they had seen potential in me. I would never have been able to do the course without a scholarship. Herts-based Emil Dale, a new partner for 2017, describes its training courses as “affordable, extreme triple-threat musical theatre”. This year the school has offered one full scholarship on the two-year Musical Theatre BTec course; one full and two part scholarships for the three-year Musical Theatre diploma course; and one part scholarship towards the one-year foundation Gap Year course. Italia Conti has an impressive history and is regarded as the oldest performing arts training school in the world. A generous offer of four scholarships this year went to Kalila Khan, 12, from Hainault in Essex; Ellie Rose Eames, 12, from Rochester in Kent (who received full scholarships); Eva-Marie Saffrey, 11, from East London, and Ben Perkins, 13, from Tolworth in Kingston upon Thames (who received 75% awards). 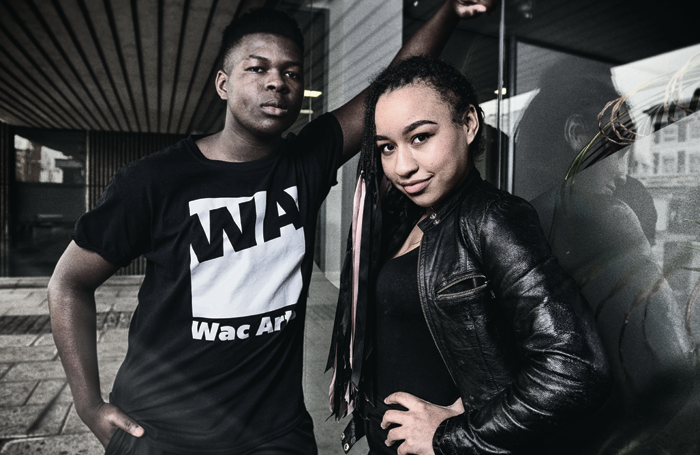 Wac Arts, which has been providing training in the heart of London for 35 years, joined the scholarship scheme in 2016. The then winner – Anais Lone, 17, from London – missed out on the 2016 photoshoot, so she joined us this year, along with the 2017 recipient, 17-year-old Gibsa Bah from Birmingham. Both were offered a full scholarship covering fees for the first year of the school’s three-year professional diploma in musical theatre. 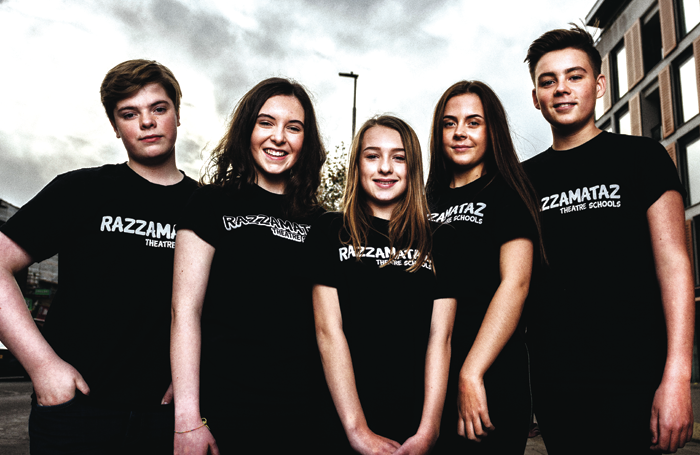 Razzamataz Theatre Schools offered 27 awards in The Stage Scholarships scheme for 2017. The winners come from right across the UK and each receives the equivalent of a year’s free part-time study. Here we meet (left to right): Zef Hudson, 14 (Raz Rayleigh West); Annie Lewis, 17 (Raz Carlisle); Amber Holmes, 12 (Raz Sheffield); Bethan Martin, 14 (Raz Newcastle); and Lewyss Banfield, 14 (Raz Medway). Pauline Quirke Academy of Performing Arts offered 114 awards in The Stage Scholarships scheme for 2017. The winners will each receive the equivalent of a year’s free part-time study. 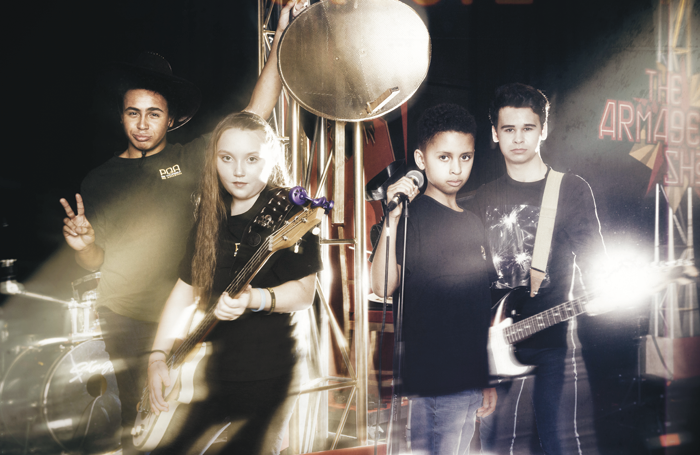 Four students attended the photoshoot: Louis Gould, 15 (PQA Romford), Charlotte Fletcher, 11 (PQA Bromley), Mason Mitchell-Palmer, 9 (PQA Woodford Green), and Charlie Caldarella, 17 (PQA Windsor). First-time partner in The Stage Scholarships scheme, Spirit Young Performers Company offers intensive part-time training courses for six to 18-year-olds. 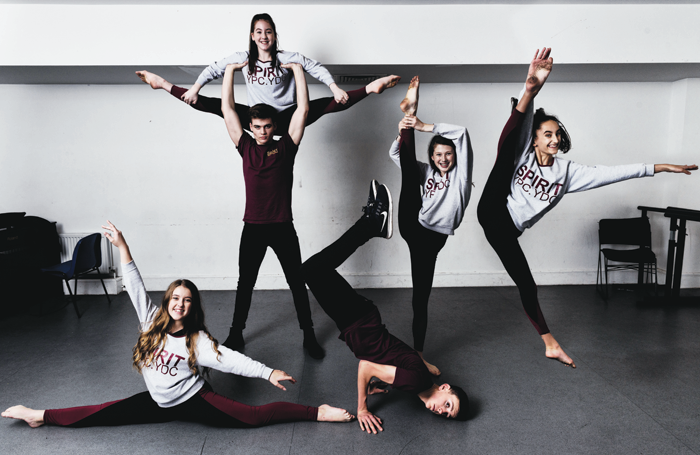 This year, six part-scholarships were on offer for the school’s Performers’ Company and Dance Company programmes. 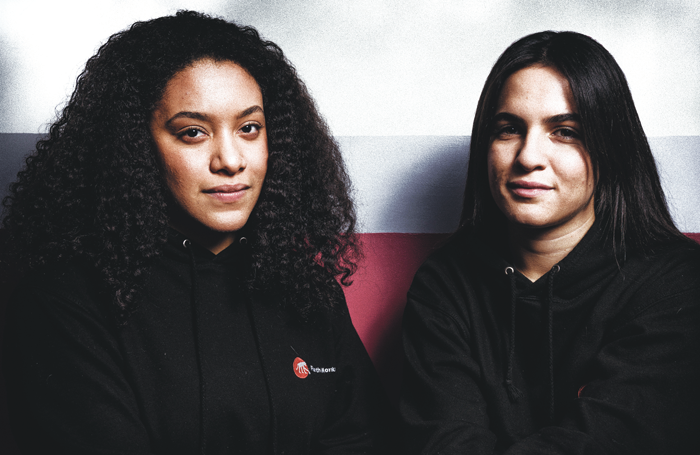 Twenty-four-year-old Naomi Denny, from Brighton, and Carla Cuscito, 21, from Bari in Italy, won The Stage Scholarships with Fourth Monkey Theatre Company and will receive 50% funding towards attending the two-year rep actor training programme. This is the third year that the Barbara Speake Stage School has been a partner in The Stage Scholarships scheme. In 2017, the school generously offered two full scholarships and five half scholarships. * Also receiving part scholarships are: Natahlia Colbourne, 11, from Bromley and Mia Hall-Sessions, 11, from Hillingdon in London. 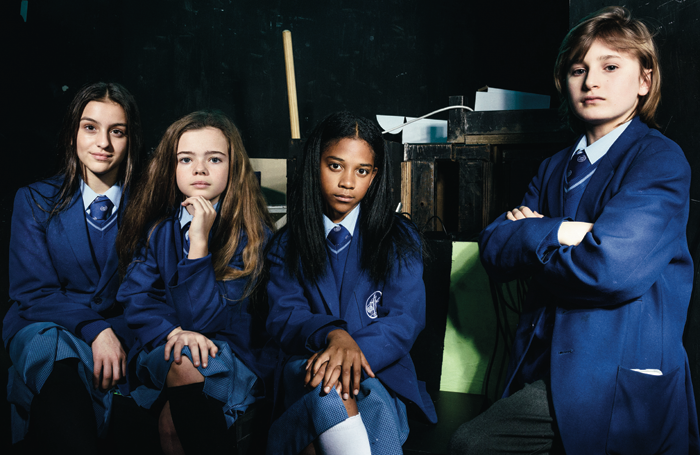 It’s now a quarter of a century since Sylvia Young Theatre School became involved with The Stage Scholarships scheme, demonstrating Young’s commitment to the nurturing and training of young talent. 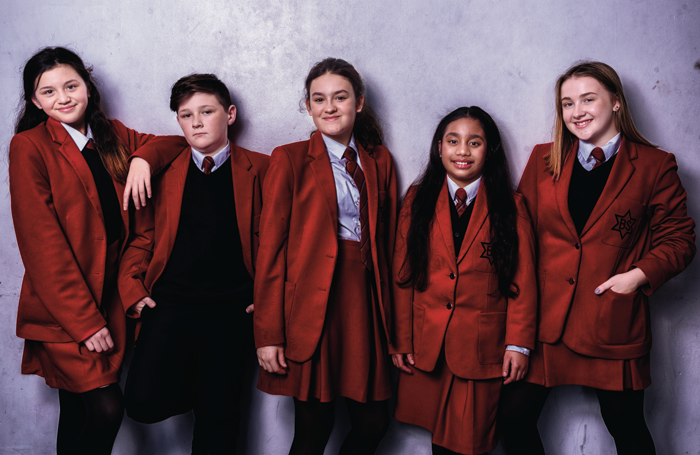 Over that period, Young and her team have helped more than 70 children to pursue a career in the performing arts through the scholarships scheme. 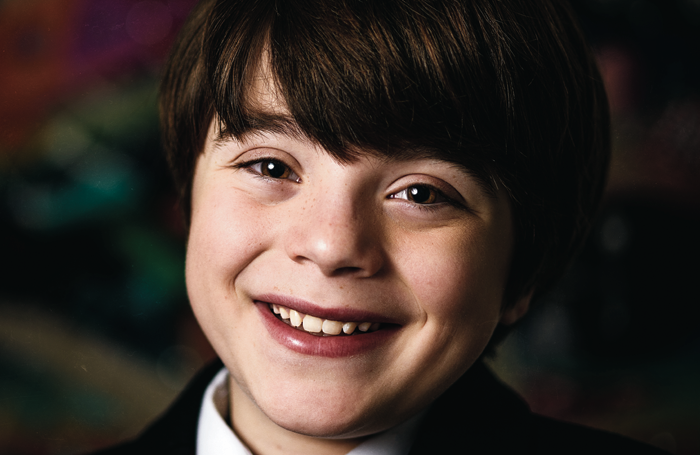 Nicholas Antoniou-Tibbitts, aged 12, from Hempstead, just outside Saffron Walden in Essex, will attend the Sylvia Young Theatre School full-time until Year 11. Along his professional credits is the role of Eric in the West End production of Matilda the Musical, and it was between matinee and evening performances of the show that Nicholas discovered he had won The Stage Scholarship: “I was heading back to the theatre when Sylvia Young called to tell me I had won the place and the scholarship. I couldn’t believe it – I was thrilled, excited and happy.